I've written several Python scripts to help parse and handle scripture material. Once you have raw access to the scripture text, you can do all sorts of fun analysis. Because of NIV copyright, I can't share the full scripture text. 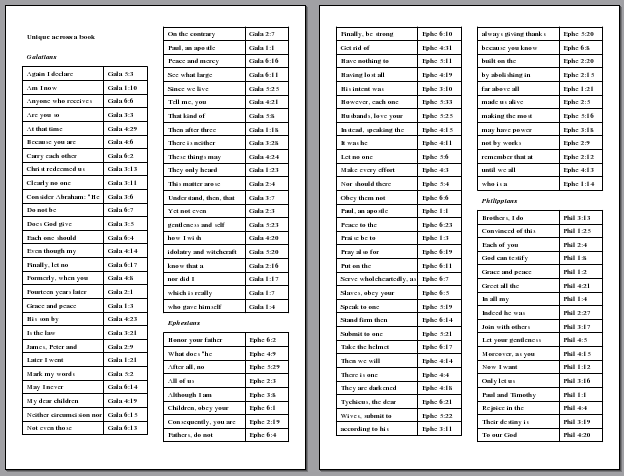 However, I can share a tool that will help you generate your own copy of the scripture text. The result of the below script is a compressed pickle'd format, which is easy to unpack and parse in other Python scripts. It legally scrapes an online source, which can only be used for personal use. You can still share lists that you derive from the text, but not the full text itself. print "\tchapter doesnt exist, moving to next book"
print "done, all scraped data available in scraped.txt"
Quoting bees are fun, but generating the lists can be painful. This Python script automatically builds a PDF while following rules, such as minimum and maximum word-count for verses, and minimum distance between verses. It assumes that you've built the scripture text library using the script above. The reportlib library is quite flexible, and you could format the quoting bee output in any way you'd like with only slight code editing. There are quite a few words omitted from the official concordance which can be useful to study. One of the biggest requests is creating an "of list" that has all phrases of the type "... of something" or "something of ...". This script uses the scripture text generated earlier to create these "of" lists for your own study use when creating lists. It could easily be adapted to build an entire concordance by running over each word. Quotation completion questions are usually pretty easy if you know the scripture text, but at higher levels of competition some question writers can choose to leave out any contextual information. There could be a quotation completion over all of the material, which means you need to know all the verses that have unique first-words. This script creates a list of unique first-word verses at a variety of levels. 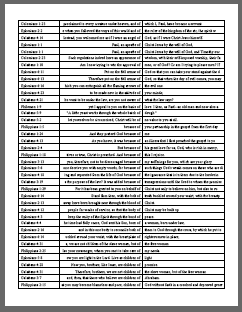 First, the list of all 76 verses across the entire scripture text that have unique first-words. 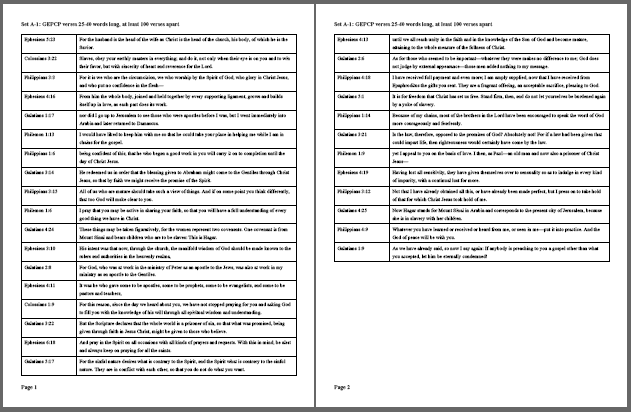 Then, to show the power of the script, we create the unique first-word lists for each book, chapter, and section title. Only the first three words of each verse are included, because they are usually enough to link to the correct verse. This script also shows how we can change the page size to fold and fit nicely inside a quiz book--when printing be sure to print two-to-a-page. It also shows how easy it is to create two-column lists.